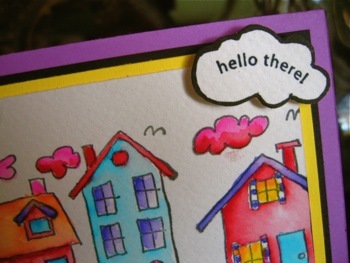 Use This Stampin Around Wheel To Create Your Unique Neighborhood. This Stampin Around wheel is so cute, I just had to have it when I first saw it in the Stampin Up Catalogue. Because this wheel has such a great linear design, it lends itself perfectly to a number of colouring techniques - the most obvious to me is water-colour which I chose for the example on this page. You can choose whether to use it with the Stampin Up Markers (they use water based pigment ink), water crayons or water-colour pencils. Another option would be using the markers or regular coloured pencils and colouring the images in solid colour. The latter technique is perfect for the younger artists in our households as it is perhaps less messy and kids are able to better control their outcomes. For the example I chose to use the Stampin Write Markers and an Aqua Painter, and the card was completed quite quickly. The images on this particular Stampin Around Wheel will appeal to crafters of all ages. 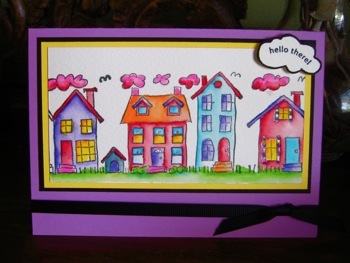 Kids will love to colour the houses in with their markers and you can bet they'll use bold, bright colours. Quite often, if left totally to their own devices, they'll choose from the primary or secondary colours. Children have excellent colour choice and they'll just plough straight in without worrying which colour to choose and where to put it. Now I can't say the same about adults. We seem to develop all these inhibitions about our creativity and art work, so we spend time agonizing about our choices. Which colour should I put on the roof of the blue house? What colour looks good next to the pink house etc? Once again I urge you to check out the information about colour and composition that you can find in the elements of design pages. Using this stamp should allow you to forget your age. It is so fresh, simple and delightful, and everyone can relate to houses and the neighborhood. The detail shot shows you how I've added a greeting in a raised cloud. Have you ever seen clouds this pink before? I haven't, but my sense of colour told me that is what I wanted - pink clouds in the sky. It adds to the fantasy of the card - unrealistic colours do that, and the use of them helps to take away the "realism" and allows you to treat the image more like a design.